Beautiful Incentives: Get Healthy with Cheribundi. Plus Giveaway! Get Healthy with Cheribundi. Plus Giveaway! I have discovered an amazing new drink for the summer. Even though fall has come upon us, it's going to be be summer where I am for a little longer than the north. Florida has started to simmer down, but not quite enough to call it fall. So refreshingly cold drinks are still popular on the menu! One of which I concocted today with the help of an incredibly yummy beverage called Cheribundi. It is made of my favorite fruit on earth, cherries. Not only that, but some of the juices include teas. Two of my favorite things in life. 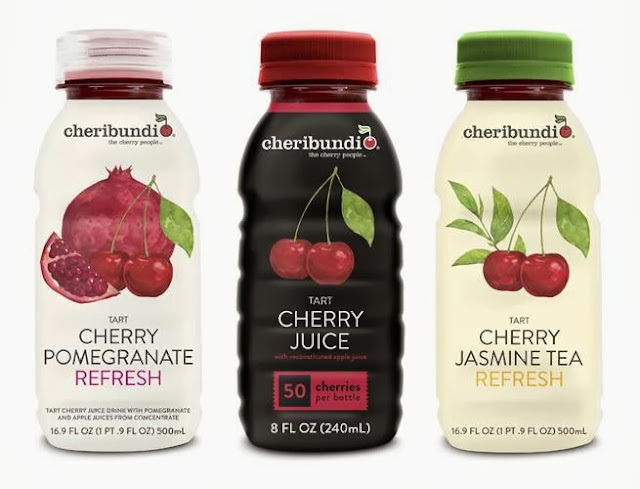 Cheribundi is such a refreshing and unique drink and you are going to love what I have to say about them. Especially the benefits and a nice little simple recipe. 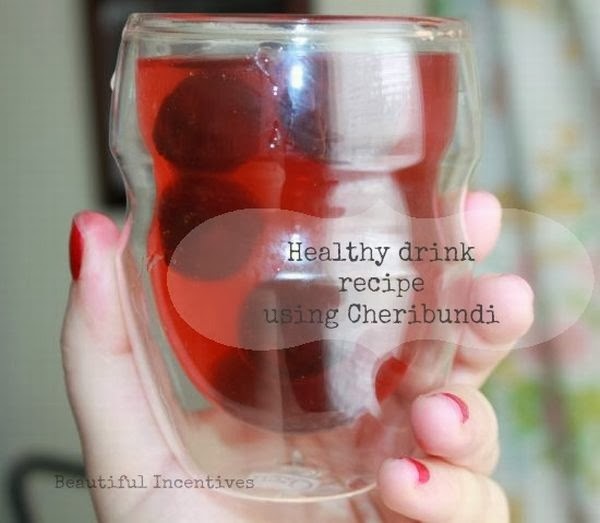 Cheribundi is a wonderful marriage of different tastes that dance on your tongue with cherries. I have tried several different flavors of theirs and they are ALL very tasty, but the ones with tea flavors have to be my ultimate favorite. What are the health benefits of Cheribundi? Cheribundi is loaded with natural cherry juice which has phytonutrients and anthocyanins. Each bottle has at least 25 % tart cherry juice in it. Which is mixed with other juices from concentrate. When I took my first sip it was indeed very tart, but not overwhelmingly. I loved it. It's very sweet too. 18-22 grams of fruit and added sugar in every bottle. Cheribundi does not have any preservatives aside from the citric acid. Athletes such as runners have claimed that their tart cherry juice has significantly relieved pain and inflammation. Others have reported different benefits such as healing from certain disease. This juice also contains natural melanin which aids in a good nights rest. My absolute favorite flavors were the cherry lemonade, cherry pomegranate, cherry jasmine tea and cherry green tea. The tea mixes have less of the tart cherry juice . 5% juice to be exact and more of the tea, which is a great pick me up from the caffeine. I decided that I wanted a healthy drink that wasn't filled with too much sugar, but still satisfying. The drinks are delicious, but the sugar content was a little too much for me, so I came up with a drink that wasn't quite as sugary. First, I poured two different flavors of cheribundi into ice cube trays and let those freeze. Then I poured some water in my glass (1 cup) and dropped a few of the juice cubes into the cup. Then I dropped a couple fresh cherries in there to bring out the natural flavor of the juice. It turned out yummy. Not too sweet but not watered down. Just right and nice and cool. Great for a post workout drink too. This make the drink last longer so I'll have even more cherry goodness. I encourage you to try Cheribundi with some sparkling water as an alternative to soda too! It's really yummy and satisfies that craving without the unhealthy additives! "The Cherry People" at their social media sites. You can find it at most health food stores like Whole foods. If you can't find them near you, they are available on Amazon! Take the 7 day challenge on Facebook and get coupons to get them cheaper! The lovely Cherry People have offered up a giveaway for a whole case of this delicious beverage! I love both of these things! Count me in!! I love both of these! Count me in!! Tart cherry juice sounds lovely to try! The Jasmine Tea would be a nice combo! I LOVE Cheribundi! I love cherries in general, they are my favorite fruit :) I would love to win, thank yoU!!!! I love your idea for making this juice less sugary! I agree the sugar content is up there, but it's still yummy for a treat! Cherry is my favorite flavor. I'd love to try it. This is the first I have heard of Cheribuni. I like the idea of mixing it with wine. No, haven't tried before. Would like to try the cherry jasmine tea. I'v never had one but the Jasmine Tea looks amazing! I have not had a tart cherry juice drink, but I would like to try it. I've not had a tart cherry juice before but I've been meaning to pick some up and try it. I'd love to taste the Cheribundi Jasmine Tea; it sounds delicious. No, I haven't tried them, but I think the cherry lemonade sounds good. I have never had one but would love to try it!!! Never tried to juice but would love to!! I have never tried one of these before. However, I would love to try the Cherry Jasmine Tea! I have had a tart cherry drink before, but not this brand. I have not tried any cherry tart drinks so Id start with the plain cherry. I like cherries so it should be good. I haven't had this drink, or other cherry drinks, but I do love cherries! I find that a tart drink quenches my thirst better than a sweet one! I really look forward to the Refresh, cherry jasmine green tea, I think it would be great. I don't recall ever trying one...but I think I'd like the Tart Cherry one best. yes i believe i have had some tart cherry drink before but not cheribundi, i would love to try the one with Jasmine Tea also because I like tea! nope and the tart cherry juice! I have never tried Cheribundi but I would love to try! I have never tried these but would love to ! I have not tried any cherry tart drinks before. No, I haven't but cherry sounds good. never tried it would lov ethe cherry jasmine tea. Cheribundi juices look delicious. I would love to win this and try them. I like tart cherry juices and I would like to try this brand. The only cherry juice I've drank is Juicy Juice but I would love to try the Cheribundi Tart Cherry flavor..thank you.